Ste. Genevieve, Mo.— The Missouri Department of Economic Development (DED) today announced Ste. 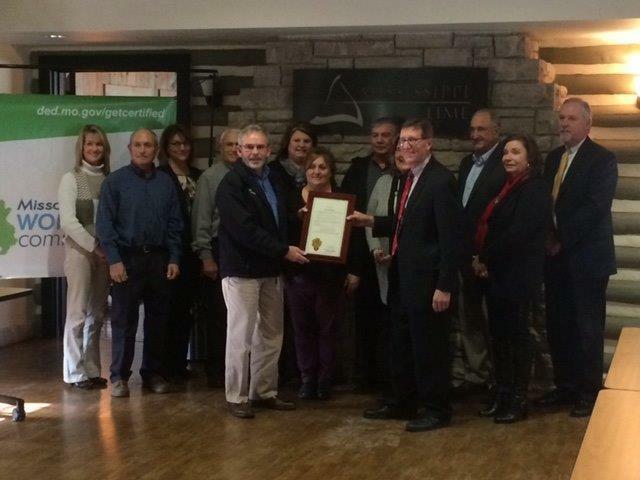 Genevieve County has achieved official designation as a Certified Work Ready Community (CWRC). The initiative helps communities validate the skills and knowledge of their emerging, transitioning and current workforce. By leveraging the National Career Readiness Certificate and achieving CWRC status, Missouri communities demonstrate they have the necessary partnerships in place to attract, develop and retain a workforce, with the education and fundamental skills to succeed in the 21st Century. "The Work Ready status is an important distinction for communities like Ste. Genevieve," stated Chauncy Buchheit, director of SEMO Regional Planning. "This national certification is good for job applicants and for the companies that are hiring. It also sends a message to companies, who may be considering a move to the area, about the qualifications of the workforce." The ceremony was held at the Mississippi Lime Company Learning Center, a large supporter of the program. Other local supporting employers include Citizens Electric Corporation, Contemporary Engineering Designs, Inc., East Missouri Action Agency, Inc., MERS Goodwill, and Sabreliner Corporation. In 2012, Missouri was selected to be one of the first four states to participate in the CWRC initiative, and in 2013, Jasper County became the first CWRC in the nation. Missouri now has 83 counties that are actively participating in the CWRC initiative and 38 fully-certified counties. New certifications are considered on a quarterly basis. Workers better understand what skills are required by employers and how to prepare themselves for success. Businesses can more effectively communicate their workforce needs to area education and workforce training programs. Educators have better tools for closing any skill gaps by establishing career pathways for students with stackable industry-recognized credentials. Economic development organizations are better equipped with an on-demand reporting tool to promote the quality of their workforce. For more information about CWRC and how to apply for certification, visit www.ded.mo.gov/getcertified.